After more than 15 years behind bars, a Cuban named Fernando González was released from prison on Thursday and immediately turned over to immigration officials. A member of the “Cuban Five,” Mr. González returned home today to his family. While we celebrate his freedom, it makes no sense to us that Antonio Guerrero, Ramón Labañino, and Gerardo Hernandez remain jailed in America, and Alan Gross remains jailed in Cuba, and all still face years of confinement before the reunions with their families can take place. 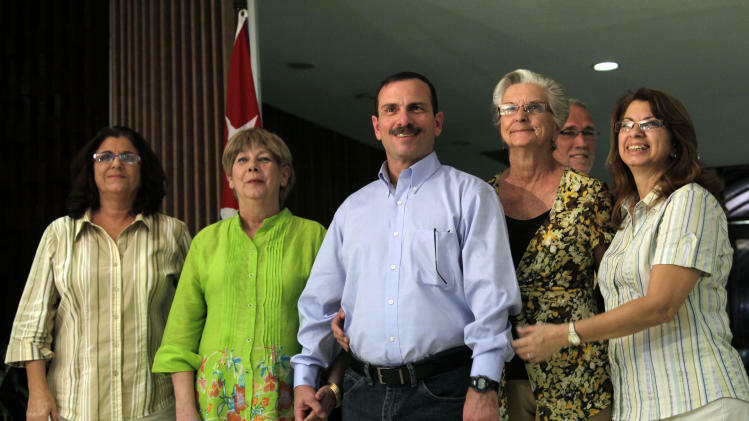 The Obama Administration has refused appeals to swap the Cuban Five members in exchange for the release of Mr. Gross, dissuaded apparently by phony discussions about equivalence. Critics say the Cubans were here as spies, but they obfuscate the motives the U.S. government had in sending Mr. Gross to Cuba, and mislead their fellow Americans about his mission when he entered that country and engaged in serious violations of Cuban law. It seems to serve the purposes of those hardliners to have him sit in prison for his full fifteen year term, so long as he is not considered a spy. President Obama has a chance to end the suffering of all four prisoners by setting aside the argument over equivalence and do what needs to be done to bring an American, who has been left on a Cold War battlefield, home to be reunited with his family. If that means ending the wait for the families of the three remaining members of Five for their homecoming, that’s a small price to pay. It will make the Cubans happy, virtually no one in the United States outside a few precincts in Florida and New Jersey will care, and the President can have the satisfaction of restoring four lives and uniting four families. Rather than freedom for one, why not mercy and compassion for four?